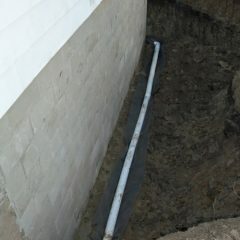 Sometimes, We Have to Do Basement Repair From the Outside in. Step 1 – We dig down to footing, cleaStep 1: WeLay down exterior drain tile. Step 2 –We apply a mastic tar adhesive and a Sealant. 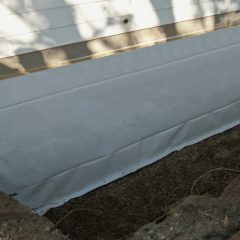 Step 3 – Attach our 20 Mill fiber reinforced Flexi-Seal to the wall. 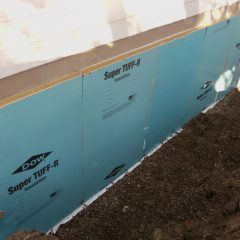 Step 4 – Attach EPS Foam Board insulation then backfill with stone and dirt. Let’s Go Play in the Dirt! You’re not exactly sure why your basement is so swampy. That’s why you’re here. If you give us a call at 800-782-9379, we’ll come to your house and figure it out. Sometimes, we’ll determine that we need to waterproof from the outside, which involves using a mini excavator, triple wall drain tile and a reinforced vapor barrier, and a whole lot of elbow grease. But hey, we like playing in the dirt. 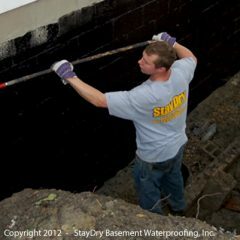 Our exterior wet basement solutions safeguard your lower level and come with a 10-year fully transferable warranty. Whether your home needs help on the inside or the outside, we’ve got the gentlemen for the job. And in case you don’t know by now, we’re a lot more than just basement waterproofing. Check out some of our other services, such as mildew treatment and foundation wall repair.